Under the aegis of Cycling Federation of India (CFI), Wisdom Eventosport is going to organise a cycle expedition ‘North Quest Challenge Ladakh 2018’ on September 30 in Leh. The challenge will be held under three categories including, Elite Race in which 40 national elite riders covering 58 km in 6 laps will participate, Amateurs Racing for all with registrations and Children Talent Hunt for the student of age group 10 to 16 years in which 100 students have already registered. The race will start from Shanti Stupa at 6 in the morning and covering different areas will culminate at the same start point. The selected participants in talent hunt will be taken to Delhi for professional training by CFI free of cost. All expenses of boarding, lodging, schooling, travel, equipment, training and diet will be sponsored by CFI. 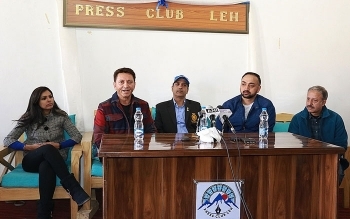 In a press conference held on September 28, V. N. Singh, Director, CFI informed that the purpose of organising Northquest in Ladakh is to give a platform to the children and to introduce mountain biking event in the region. Stany Wangchuk, Partner Wisdom EventoSports said that North Quest is the first of its kind of competitive Cycling MTB event in Leh, Ladakh. He said that the first edition of North Quest was held in September 2016 during which a talent hunt was conducted for school students. “Legzes Angmo won the gold medal under 14 National Track Championship held in New Delhi in January 2018. She was among the five students qualified in the last edition talent hunt and we feel proud to tell that she is the first female from Ladakh and J&K state to become a national champion in any cycling event”, he said. The event is sponsored by Air India, Thomas cook, ONGC and others.